Greenhook Beach Plum Gin is an infusion of local Beach Plums in Greenhook’s namesake American Dry Gin. Although made with local plums, it is squarely part of the Sloe Gin tradition. It’s bottled at a slightly higher proof than most other gins of this type, coming in at comparatively robust 30%. It’s sweetened with Turbiando sugar. 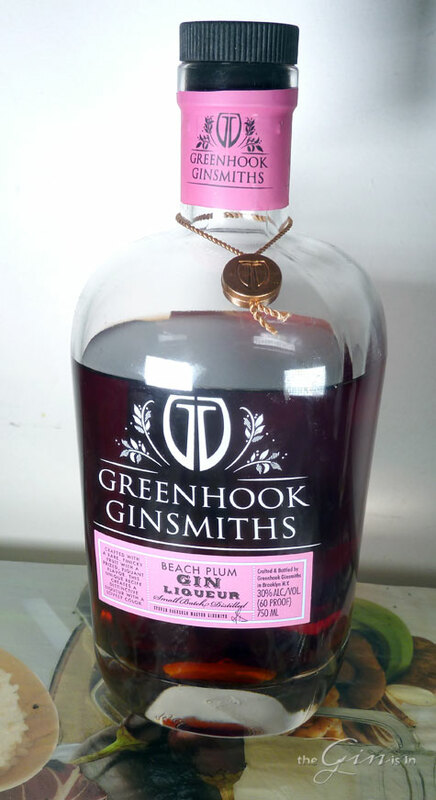 Greenhook Beach Plum Gin is a lovely ruby color, shimmering in a bright deep red. What’s a Beach Plum? It’s a native east coast of the united states bush that grows in coastal sand dunes. The small fruits are edible and when not being used to make local gins, they are used in wines and jams. The fruits are edible and there are specific cultivars which have been bred to produce more delectable fruits. The plant is also common enough to be the namesake for several places along the East coast, including the evocative “Plum Island,” New York or Plum Cove, Massachusetts. On the nose of Greenhook Beach Plum Gin: lemon, lime, chamomile tea shine most brightly. You start to get some spiced notes as well with cinnamon and ginger, before the drink settles into a rich mid and low-note profile with red raspberry. Very inviting with a lovely bouquet. The palate begins with a little bit of the spice notes, ginger and cinnamon, before chamomile comes through as well. The rich tart, and less sweet than other cordial gins, plum-cherry sweetness dominates the mid-notes. Here is where the drink seems to come squarely into line and fits with other Sloe Gins with a bright robust sloe note on the finish. The end is crisp and somewhat dry with tart raspberry notes. This gin is very inviting, very smooth, and quite flavorful, with plenty of notes from the gin coming through. When mixed with lime and ice, the citrus like lemon-lime notes we tasted neat come to the fore again. Sloe-like notes segue into a finish which is slightly sour with cinnamon, ginger, and allspice on the finish. Very nice and refreshing. The next drink we tried it in was the blackthorn. Chamomile tea and ginger notes almost immediately, cassia and cinnamon lingering in the background as well. It comes off quite strong, with fermented ripe fruit in the mids, and a touch of bitterness on the finish. Very nice, and disarmingly complex. If you didn’t know you were mixing with a cordial gin, I’m not sure you would guess it. This could be any well made cocktail at any nice cocktail joint. Highly recommended. Mixes nicely and has a fantastic flavor that carries it in nearly any cocktail you try it in. Quite complex, with bright, clear, gin notes in the background. Greenhook Beach Plum Gin is one of the best sloe type gins on the market today.